As I mention in the write-up for the company, there is not much information to be found about any of their pens. The only thing I can say with any marginal confidence about this pen is that it is an Élysée, and that it was likely made before 1991. Both these statements come from an examination of the cap, which has an impression of the company’s name and “W.-Germany”. Since the sundered parts of Germany were reunited in 1990, and since changing imprints takes a little time, 1991 seems a safe guess. I assign model number based on some other somewhat tentative identifications on some sale sites, and if any actual evidence appears I’ll amend this identification faster than I change a hat. That this pen was made more to be worn than used is obvious from the design. It has the desperate thinness of pens of the 1980s, and the nearly-fraudulent weight granted by a heavy-walled brass body. This weight, I should mention, is reasonably well distributed and even posted it bears the hand down less than the similarly-proportioned Pelikan New Classic. It certainly does write, which puts it a step ahead of some pens of a similar nature I’ve encountered, but it’s not meant for writing at any length. I find it interesting that the instruction sheet included in the book has a fairly standard guarantee against faults arising from materials or workmanship, but has absolutely no contact information for the company; if it falls to bits, you need only find us and we’ll replace it. There is a hidden aspect to pen which needs comment. At the bottom of the barrel is a little spring-loaded platform, the function of which is to press the cartridge firmly against the underside of the section. This is a cool little device, as it ensures the cartridge will remain in contact (assuming there’s a pair of them if using short cartridges) and thus reduce the chances of a messy drop-out, while putting pressure on the section threads to prevent it separating from the barrel. However, it also makes using a converter a very risky prospect. If using a screw-piston type of converter, there is sufficient contact between the end of the converter and the plate to work the mechanism. This doesn’t matter when inserting the converter, since screwing on the barrel works the converter in the ‘intake’ direction. However, removing the barrel runs the converter’s ‘expel’ cycle, and the difference in pitch between the mechanism and the pen means that by the time the section is free, the piston is right up at the mouth of the converter; even an empty pen will bubble and spatter. With the simpler stick-piston converter, it is possible to avoid trouble if one remembers to put the stick in about 6mm to keep it from being unexpectedly pressed by plate; reduced volume in what is already a rather low-volume reservoir. Squeeze converters should work, if one can be found with an international mouth. Cost When New: $100 (I am guessing; while an informant suggests most models topped $300, this seems more of a bargain model. For modern value, try this calculator). 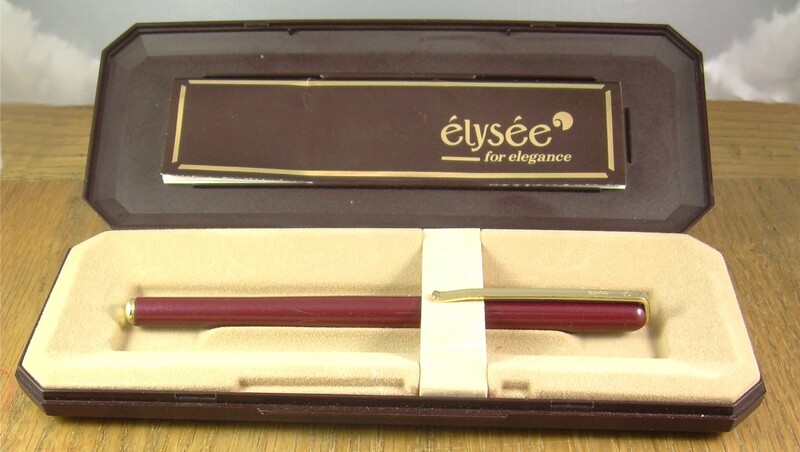 At the end of 2011, this pen could be found for sale as “new old stock” between $40 and $60, which seems a fairer evaluation of its actual worth. Size: 13.9 cm long capped, 15.5 cm posted, 12.8 cm uncapped. Point: Plated steel (no hallmarking, and such a point was not unknown in Élysées; more bolstering for my cost guess…). Despite the looks, the Élysée appeared several years after the toppling of Disco. The presentation box. I had it in mind that “Élysée” meant something else…. The inside of the box, with the pen resting quietly. Note the not-very-helpful owner’s manual in the lid.